Do they yodel in such a remote place as Papua New Guinea ? Yes they do ! The country is inhabited by different ethnic groups, most of them live very isolated. The Huli are the most important ethnic group in the Southern Highlands province. 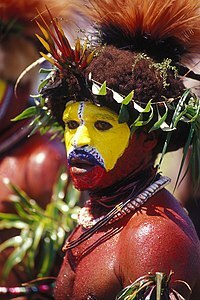 They are characterised by their headdresses: at great ceremonies, singsings, men wear big wigs made of human hair and they paint their faces red and yellow, the colors of the birds of paradise. They yodel in different occasions. Here are two examples: the first one (Ho) is an exchange of calls between men in the mountains. It was recorded by Charles Duvelle (a renowned French field recorder) in 1974 in the Yugu of the Huli group in the region of Hedemari (a sub-district of Koroba, in the Southern Highlands district). It comes from the Philips Prophet cd Papua New Guinea. Huli (Highlands). The second type of yodel is Mali iwa. It is a war song and ritual dance, sometimes accompanied by drums and with yodel that sometimes imitate the cry of the paradise bird. Here are three versions. The first one is from the same cd as above, recorded in 1974. The two others were recorded between 1992 and 1993 by Manuel Gomes and are edited on the cd Music of Papua New Guinea (Buda). You are currently browsing the archives for the Papua New Guinea category.